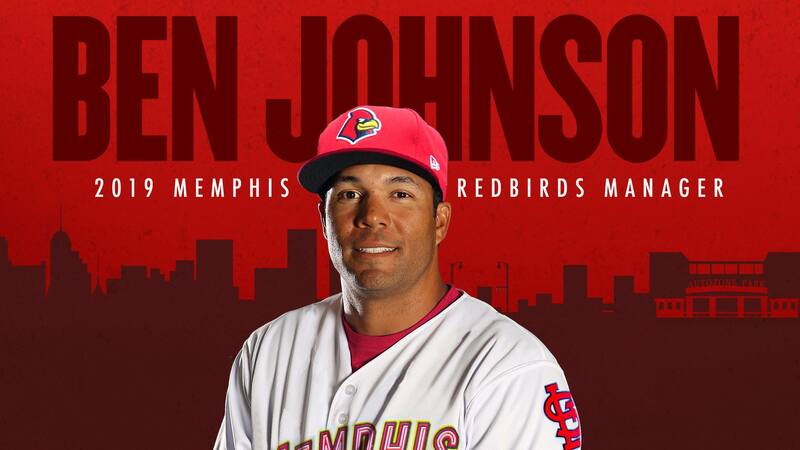 Memphis native and former St. Louis Cardinals minor league outfielder Ben Johnson will manage the Memphis Redbirds during the 2019 season, the Cardinals announced Friday. Johnson becomes the eighth manager in Redbirds history and replaces Stubby Clapp, who was promoted to the Cardinals staff as first base coach after leading the Redbirds to back-to-back Pacific Coast League championships in 2017 and 2018. Johnson returns to The Bluff City after spending the 2018 season as a coach for the Durham Bulls, the Triple-A affiliate of the Tampa Bay Rays. Prior to that, he spent three seasons as a scout with the Arizona Diamondbacks. His previous managerial experience came with the independent Arizona Centennials of the Freedom Pro League in 2012. The 37-year-old attended Germantown High School in Memphis, and he was drafted by the Cardinals out of high school in the 4th round of the 1999 First-Year Player Draft after being named the Memphis-area High School Player of the Year. After turning down college baseball and football scholarship offers to sign with the Cardinals, he was ranked as the fourth-best prospect in the Cardinals system and played the 1999 season for Rookie-level Johnson City and part of the 2000 campaign with Single-A Peoria. He was then traded to the San Diego Padres along with Heathcliff Slocumb in exchange for Carlos Hernandez and Nate Tebbs on July 31, 2000. Johnson made his Major League debut with San Diego on June 26, 2005, and he went on to appear in 31 games with the Padres that year. He played 58 games with San Diego in 2006, before being traded to the New York Mets in the offseason and playing nine games in The Big Apple in 2007. Johnson’s 10-year Minor League playing career spanned 901 games, where he hit .262 with 187 doubles, 115 home runs, 473 RBI, and 91 stolen bases. Johnson’s Redbirds coaching staff for 2019 includes returning pitching coach Dernier Orozco, whose Redbirds pitching staff set a franchise record for ERA in 2018, and new hitting coach Jobel Jimenez, who spent the last three seasons with Double-A Springfield. The returning athletic trainer is Matt Corvo, and the new strength and conditioning coach is Frank Witkowski. Last season, the Redbirds claimed their second-straight PCL title and fourth in franchise history and went on to win their first Triple-A National Championship with a 14-4 win over Johnson and Durham, the champions of the International League. The Redbirds went 83-57 in 2018 after going 91-50 in 2017. The 174 wins between the last two regular seasons are the most in a two-year span by Memphis professional baseball clubs since 1933-34, and the back-to-back league championships are the first by Bluff City pro baseball teams since the Memphis Chickasaws in 1952 and 1953.